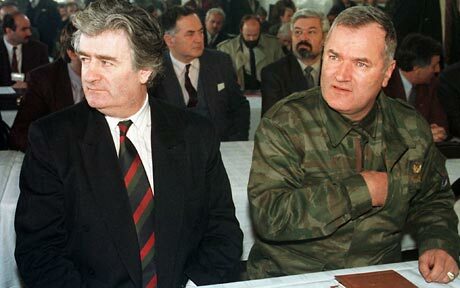 Radovan Karadžić (left) with former Bosnian Serb military leader Ratko Mladić, who is currently on trial before the ICTY. AP photo. The Archive’s Genocide Documentation Project worked tirelessly for three years to assemble a cohesive collection of declassified documents to map the atrocities committed in Srebrenica, Bosnia and Herzegovina in July 1995. Today, Radovan Karadžić, the former President of Republika Srpska (RS) and Supreme Commander of its armed forces, was convicted of genocide, crimes against humanity, and violations of the law of war by the International Criminal Tribunal for the former Yugoslavia (ICTY). Now 70 years old, Karadžić was sentenced to 40 years’ imprisonment for the war crimes committed by the Serb forces he led in the conflict in Bosnia from 1992 to 1995. While the Karadžić will most likely live out the remainder of his years imprisoned in the Hague, critics argue the sentence is far too short for the number killed under his leadership. Among the charges brought against him, Karadžić was convicted of genocide for the 1995 Srebrenica massacre, which culminated in the slaughter of more than 8,000 Muslim men and boys in the United Nations-designated “safe area.” He is also being held responsible for the 1,425-day siege of the Bosnian capital of Sarajevo, the longest in modern history, which led to the death of over 11,000 Bosnians. Karadžić’s 40-year sentence is shortened by the eight years he has already served since his arrest. This amounts to a 32-year sentence for the death of nearly 20,000 people, or about 15 hours served for each victim. 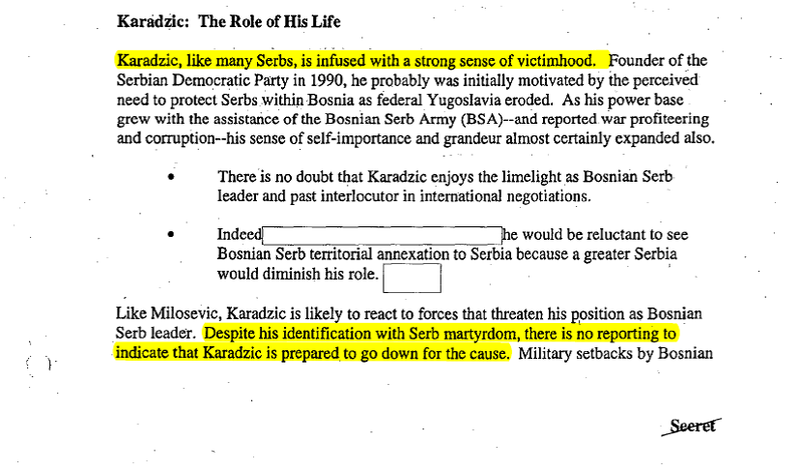 The National Security Archive’s Genocide Documentation Project’s Srebrenica collection contains documents from multiple sources alluding to Karadžić’s involvement in the war crimes carried out by his followers, including some that speculate why he might maintain his innocence in the face of an eight-year trial. A sense of “victimhood” coupled with a rapid accumulation of power and resources indicated he was possibly not “prepared to go down” for the Serb cause, even after the end of the war and his indictment and arrest. Documentary evidence speaks to the contrary of the denial of his responsibility. 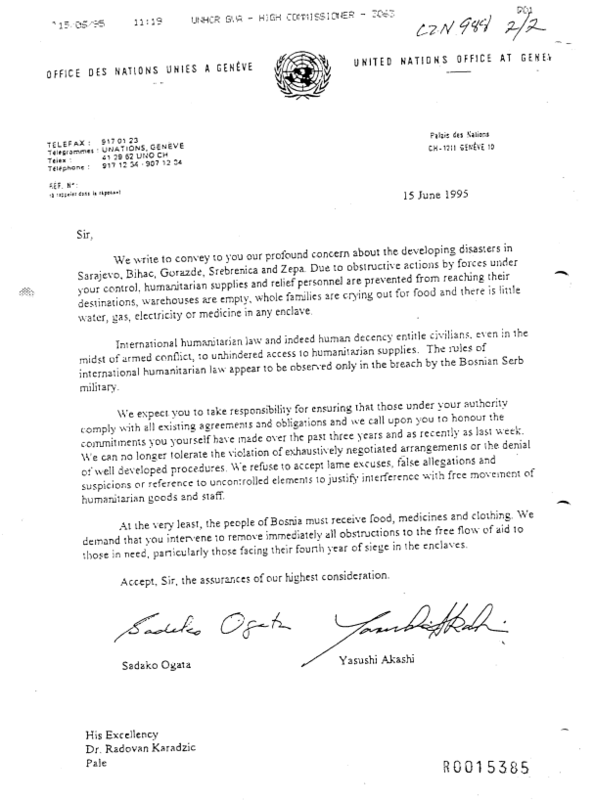 International leaders wrote many letters to Karadžić throughout the duration of the war, urging him to protect civilians and abide by international law and warning him of the consequences should he fail to do so. Karadžić and Mladić were indicted by the ICTY in 1995 and today, over twenty years later, one of them was brought to justice. UN High Commissioner for Human Rights Zeid Ra’ad Al Hussein describes the verdict as “hugely significant” and adds that the trial “should give pause to leaders across Europe and elsewhere who seek to exploit nationalist sentiments and scapegoat minorities for broader social ills.” Whether or not the conviction will support reconciliation efforts in Bosnia, however, remains to be seen. The Genocide Documentation Project, launched in January 2013 in partnership with the United States Holocaust Memorial Museum, explores the failures of the international community to prevent or effectively respond to past cases of genocide. Through detailed case studies, the project’s research seeks to inform international policies regarding the prevention of and response to genocide and mass atrocity. By examining the role of the international community in past incidents of genocidal violence, these case studies help shape the views of a new generation of policymakers both within the United States and around the world. May Assad and his minions be next.